There are no more diary entries in 1924 and none for 1925. ‘From My Window’ continued, and from those we can see that Enid and Hugh may have spent their honeymoon touring England, as the Talk called ‘Oxford’ suggests. That was written in September (Enid was still not back to her organised best, so doesn’t give it a specific day of production) and appeared on September 17, 1924. Also written in September for Teachers World was ‘Fire Engines’ which appeared on October 8. By this time, Enid and Hugh were living in a flat in Chelsea. In the Talk, Enid goes out to watch a number of fire engines crossing Battersea Bridge. She mentions the presence of her ‘scandalised husband’, who pulls her back from going and asking a fireman whether he likes driving his fire engine and where the fire is. By the end of September, Enid and Hugh were at sea, touring the Channel Islands. On September 29 Enid wrote ‘La Corbiere’, about the lighthouse on Jersey, and the next day ‘Dawn at Sea’, which gives no further clues as to where they are, but contains a superb description of the sun rising above the horizon and kick-starting the day. 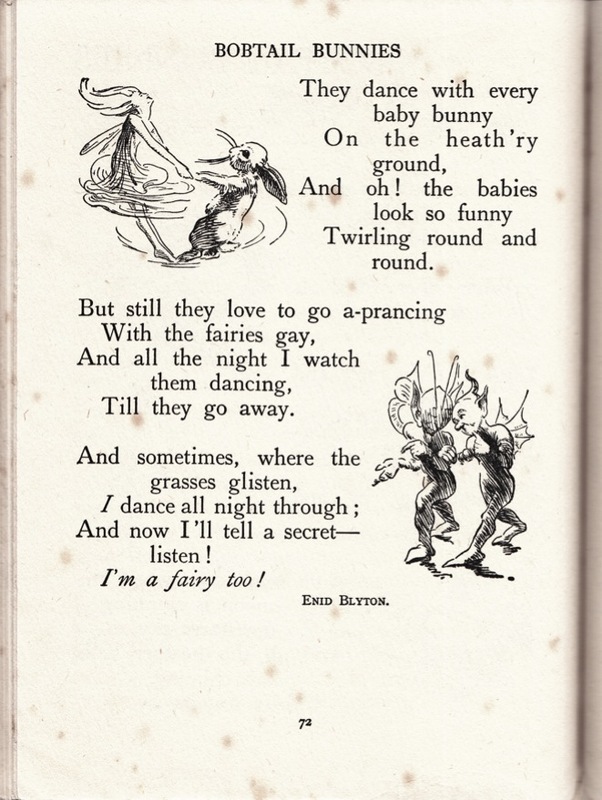 In October, The Zoo Book and The Enid Blyton Book of Fairies were published. Surely an exciting time for the young couple, editor and author both. But the fact that it was a wonderful time for them is evidenced in November and December. Because that is when Enid wrote most of the chapters of The Enid Blyton Book of Bunnies, later retitled The Adventures of Binkle and Flip. The work log tells us that the early names of Binkle and Flip were Sandy and Bill. Sandy is a Scottish version of Alexander, Hugh’s middle name. Significant? Bear in mind that in 1928, Hugh would interview Enid for Teachers World, signing the piece only H.A.P. And in 1942, Enid would write under the pseudonym of Mary Pollock (her middle name and her married surname). Once Binkle is thought of as Hugh, and Flip as Enid, everything in the book falls into place. According to Barbara Stoney, Hugh and Enid called each other ‘Bun’ and ‘Little Bun’, respectively, during the early years of their marriage. Sandy and Bill share a bed in a cottage in Oak Tree Town. They are always looking for easy money and up to mischief. Their escapades are funny, written in a light and uplifting way, clearly reflecting the joy that Enid was feeling as a newly-wed.
"Is there any food in the cupboard, Binkle?" asked Flip, opening one eye, and looking at BInkle, who was dressing. "No, there isn't, and you know that very well!" snapped Binkle, who was in a very bad temper. "You just jump out of bed, you lazy thing. We've got to work today, if we want any food to eat." "Oh, oh!" groaned Flip. "I do hate work! Whatever can we do Binkle?" The jokes have started already. First, Enid-Bill-Flip loved work and could toss off a 3000-word chapter at the drop of a hat. Second, Hugh had a bad temper, though he usually apologized after losing it, and became very considerate. Third, Hugh-Sandy-Binkle and Enid-Bill-Flip had, as we know, been working very hard together. 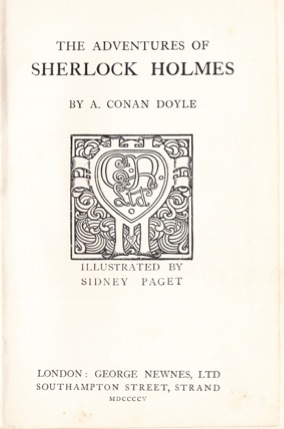 Just a month before, Hugh as editor, and Enid, as writer, had published two big books full of creamy paper covered in finely printed words of hers. Enid and Hugh had newly moved into a flat in Chelsea, which was surely stuffed with fine food, and if it wasn't then they could pop round to Rules in Covent Garden, or the Chandos Grill off the Strand, where they did regularly eat. No food in the cupboard. Ha-ha-ha! In chapter one, 'Swee-ee-eep! ', Binkle steals the chimney brushes of Brock Badger and persuades Flip to help him clean a few chimneys in Bracken Hill Town. This initiative does not go well. Their next money-making scheme is when Binkle (Sandy) persuades Flip (Bill) to look after four baby foxes ('Bill's New Job'), echoing Enid’s teaching job at Southernhay, which began with her looking after the four Thompson boys. Enid worked there for four years, giving it up just two months after meeting Hugh in February, 1924. So the bit about how Flip makes a dramatic escape from the clutches of the parent foxes would also have had an in-joke factor for its author and editor. What’s more, the foxes’ house is located in Cuckoo Wood. Enid took a break after having written a third chapter. She'd set out her stall in her own territory. The place names in the book come from her own personal mythologizing of Beckenham, where she'd grown up. The book emanates from her home-town just as much as it does from her new marriage. I don't think at this stage, Enid necessarily knew she was writing a book, as such. But she'd obviously enjoyed writing the first three chapters, and a couple of weeks later she wrote four more, at the rate of two per day, plus another one before Christmas. Enid then took a long break from her Book of Bunnies, not coming back to it until May. In the meantime, other things need to be recorded. She devoted two of her weekly From My Windows in Teachers World to the subject of happiness. On January 19 (published Jan 28), she wrote that she thought Happy People were the best in the world because they inspired others to be likewise. 'When, a few weeks ago, I wrote about “Happy People”, I didn’t foresee the increase it would bring me in correspondence. Now, as I write, I have before me letters from grown-ups and letters from children – wistful letters, sincere letters, and quaint letters. Everybody does so want to be happy. The children are now, and seem delightfully sure of being so in the future. The grown-ups seem to feel that happiness, real springing happiness, is always tantalizingly just round the corner. 'It isn’t. It’s here “right now,” as the Americans say. You don’t need to look for it round any corner. Some people say it’s no good looking for it at all. They say it’s a by-product of other things. Well, I’ve been looking for it straight ahead all my life, and I’ve always found it. I don’t mean Content – though that is a very lovely thing – but real, proper, exultant happiness that makes you want to sing, and gives that lilt of the heart which is so well-known in childhood at the thought of some delightful treat! Enid is a fairy?. I thought she was a bunny called Flip. Stop flipping about, Enid! 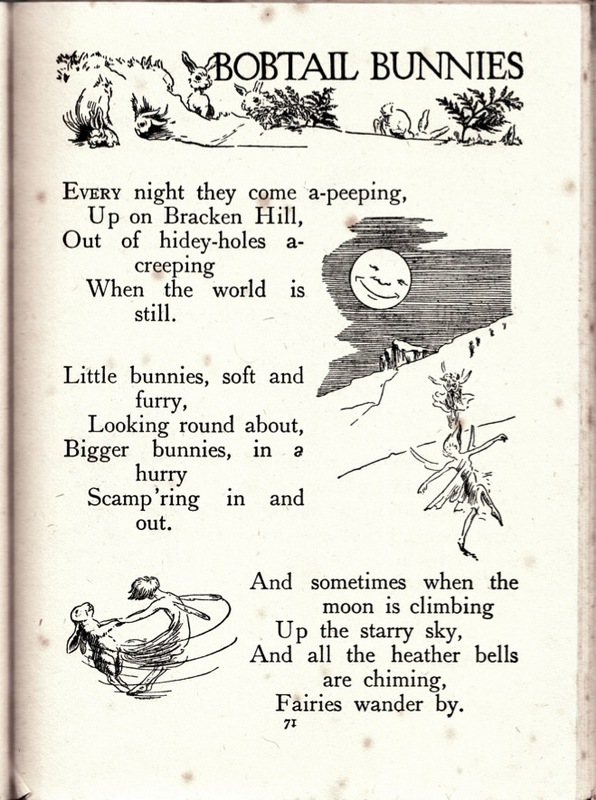 Are you a bobtail bunny or a flipping fairy? We really need to know. Come the beginning of May and she wrote three more Binkle and Flip chapters. The odd thing being, that when I re-read The Adventures of Binkle and Flip when I was fifty, ten years ago, I underlined precisely these three stories as being especially enjoyable. Why would that be? I think Enid, who had clearly been thinking hard about happiness, had realized just how strong her post-wedding muse was - how happy - and was exulting in its qualities and making a special effort to do it justice. It’s also true to say that in April, 1925, Teachers World had commissioned her to write a Nature Page for it every fortnight. That was 1500 words every second week, on top of the weekly 650-word From My Window, on top of the monthly full-page poem, on top of the occasional poem, story and play. The opening Nature piece was on gorse, and it was accompanied by Enid’s own drawings. The second piece, published in May, was on rabbits. Enid had a commission, which would go on for years, that suited her interests and talents, and didn’t she just love her life! 'Binkle Tries to be Funny,' opens with Flip coming back with the shopping to find Binkle sitting in a corner of the garden with a wet towel tied round his head. "Binkle," cried Flip, "what's the matter? What have you got that towel tied round your head for? Have you hurt yourself?" "Go away Flip," he said. "I'm writing poetry." One might think that Enid had got her characters mixed up. After all, she was the writer. But Hugh was a writer as well, as we know. He had that article printed in the Daily Mail in April 1924, and Enid had duly made a fuss about it in her diary. I dare say Hugh made a fuss about all the writing he did. And I've no doubt whatsoever that he found it more difficult to write than Enid did. For Enid, writing was the easiest thing in the world. No need to tie a wet towel around Enid's head while the muse was upon her! He's rather fat and he's certainly funny. This poem is written by Binkle Bunny. 'Binkle's Wonderful Picture' begins with Binkle waking up and trying to remember a terrific dream he has had. "I know!" he cried suddenly, banging the bedclothes, "I painted a wonderful picture!" "Binkle!" shouted Flip angrily, waking up with a jump, "Stop hitting me!" "You shouldn't be so near me, then," said Binkle. Binkle goes on to explain that Rombo, the famous painter-Rabbit, told him it was the best picture he had ever seen. But Binkle couldn't see any picture at all! This is the story where Binkle ends up persuading everyone in Oak Tree Town that a blank canvas is the greatest picture ever painted. Beauty is in the eye of the beholder. Especially if that eye has been tricked by Binkle bunny! And so to 'Binkle and Flip Try to Be Good'. Binkle has got into trouble so often that he feels like turning over a new leaf. But he wonders what Flip will say. He decided to tell him that night as they were getting ready for bed. :Flip," he said solemnly, "what about being good for the rest of our lives?" Flip brushed the hair on his long ears and sniffed scornfully. "Don't try to be funny." "But I mean it," said Binkle, rather cross with Flip's sniff. Flip stopped brushing and stared at Binkle in surprise. "But you couldn't be good, Binkle!" he said, at last. The story itself is not quite as good as the sublime beginning. But then how could it be? Enid realised she just needed one last chapter to complete her bumper book of bunnies. And after two abortive attempts at suitable stories, on May 27, she came up with 'Binkle gets a Dreadful Shock'. Binkle is at it again. He thinks that if the people of Oak Tree Town can be persuaded that Flip has been captured by foxes, then they will pay a ransom to get Flip's safe release. Flip is asked to hide in Cuckoo Wood while Binkle spreads the word. But the people of Oak Tree Town smell a rat, and when Wily Weasel stumbles across Flip in Cuckoo Wood they realise what Binkle is up to. So Binkle is left a note suggesting that Flip really has been captured by foxes. What surprises the folk of Oak Tree Town is how upset Binkle is. He is willing to give himself up to the foxes if they will only let Flip go. And so the people of Oak Tree Town relent. Flip's paws were untied and he scampered to Binkle, who could hardly believe his eyes and hugged him as if he would squeeze him to death. That's just six months ago, and as far as I know, Binkle has kept his word. But I am told he is already beginning to find it rather a nuisance to be good. So I shouldn't be at all surprised to hear that he and Flip have become bad bunnies once again. I hope not, but if they do, you may be sure I'll let you know. 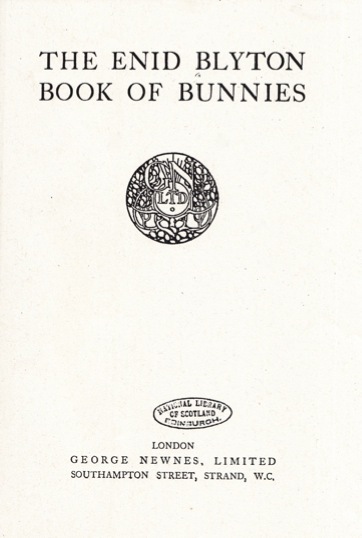 I'll end my book five months later, on September 23, 1925, when The Enid Blyton Book of Bunnies was published by George Newnes. Earlier in the month, Birns Brothers had at last brought out four 'readers' by Enid, the little books she had written between January and April of 1924. 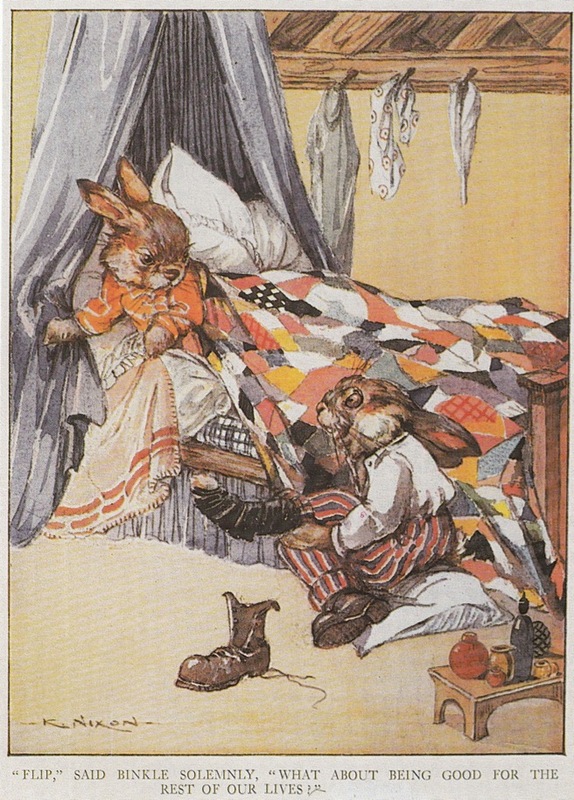 A re-writing of Brer Rabbit, a rewriting of Aesop's Fables and two books of her own stories. How lovely for Enid to have her own original work juxtaposed with her own rewriting of Greek-Roman antiquity and an odd little masterpiece from America's Deep South! Aesop's Fables includes the story of the tortoise and the hare, the over-confident hare being beaten in a race by the steadfast tortoise. And in one of the Brer Rabbit stories, Brer Rabbit is beaten in a race by Brer Terrapin, thanks to the latter’s family playing their part. Hugh: "Pity you don't have Binkle and Flip racing turtles in your new book!" Enid: "Oh, do you think I should have?" Hugh: "I think the book is perfect as is." Enid: "You're not just saying that, Bun? Like when the folk in Oak Tree Town said what they did about Binkle's blank canvas. Hugh: "No, Little Bun, this book of yours is a delight." Enid: "Are you proud to have published it?" Enid doesn’t know what to say. But that state of affairs never lasts for long. Enid: "Thank-you, Watson, I think that concludes another case." Hugh: "I don't know how you do it, Holmes. Damned if I do!" Enid: "Actually, I think I'm Watson, the writer up of the cases, and you’re Holmes, the man who figures everything out." Hugh: "Darling, I believe you're Sherlock Holmes and Doctor Watson rolled into one. Just as you're Flip and Binkle, both. I'm just the ordinary bloke who is lucky to be allowed to kiss your feet." Enid: "Kiss them, then. Oh, Hugh, I'm so happy!" As a married woman and a writer, Enid got to fly her kite. She got to fly it high and proud.